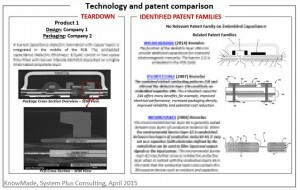 Knowmade helps clients to find evidence of (non)-infringement by mapping relevant patent claim elements to the results of the target products/devices analyzed. 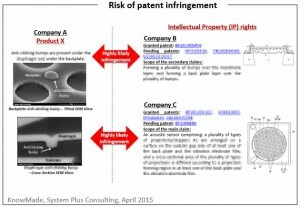 We combine technology and manufacturing analysis with patent claims understanding in order to find evidence of use and highlight risks of patent infringement. 1) Identify products at risk of infringing patents. 2) Identify potential infringing parties. 3) Obtain the product and the commercial documents, and perform reverse engineering. 4) Find the correspondence between patents and products (claim charts). 5) Confirm the suspected infringement with expert technical and legal analysis. 6) Define the strategy and the licensing terms, and contact the infringing party. 7) Assist in licensing negotiations and/or support litigation.